Meet the Captain or a crew member at the designated meeting point for afternoon English Cream Tea, before being transferred to the Magna Carta. 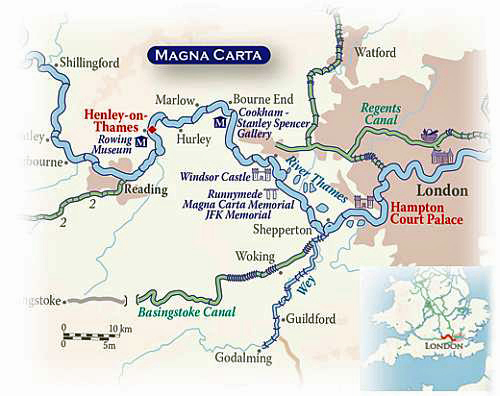 On arrival receive your "Champagne Welcome" aboard the Magna Carta moored outside Hampton Court, former Tudor Palace of Henry VIII, where we remain overnight. Dinner on board. Morning excursion to visit the state apartments of Henry VIII, whose 5th wife Catherine Howard is said to haunt the Great Hall and Gallery of Hampton Court, the finest Tudor Palace in existence. Wander through the beautiful Royal gardens and maze. 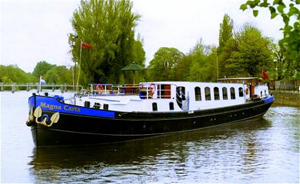 In the afternoon enjoy a meandering cruise upstream following the course of the Thames to Shepperton. Dinner on board. This morning we visit the famous Kew Gardens. With the new Bonsai collection, Palm House where all the plants have their first flush of new growth and tropical water lilies are opening their exotic blooms in the nearby Waterlily House. Plant of a smaller stature or scale can be seen in the Rock Garden and here plants from the World's mountain ranges are grown alongside Mediterranean species, both enjoying the open, sunny position and free-draining soil. Cruise this afternoon to Runnymede. Dinner on board. Today we start with a visit and morning coffee at stunning Savill Garden. Savill Garden covers 1,500 hectares in Windsor Great Park maintained by the Crown Estate and contains a diverse range of land uses. Over 60% of the Great Park is open to the public and it is estimated that more than 3 million visits are made each year. The Gardens Department is responsible for 600 hectares of the Great Park including the Savill Garden. There is also an optional visit to the nearby Wisley Gardens – 200 acres of botanic gardens, famous for their trials of new varieties. Afternoon cruise to Windsor. Dinner on board. An early morning start takes us to the Chelsea Flower Show, the most famous flower show in the world. Here nurseries, societies and charities create colour filled stands and amazing arrangements in a huge marquee outside the grounds of the Royal Hospital in Chelsea. In addition to this there are wonderful and innovative display gardens, both traditional and contemporary, created by the brightest and best of Britain's garden designers. Months of work goes into these beautifully staged displays which only last a week. After this heady and colourful assault on your senses we return to Magna Carta for dinner on board. This morning we tour Peter Freebody's boatyard and watch in wonder at the traditional craftsman at work, building and restoring wooden boats as they have done for generations. We have time to explore the ancient 11th century village including Ye Olde Belle, reputed to be the oldest inn in the country before returning to the barge and cruising through fabulous countryside to our final mooring situated along the famous Henley Regatta Rowing Course. An earlier lunch followed by a 40 minute drive to Oxford. A fascinating tour of Christ Church, Oxford's grandest college, founded twice, once by Cardinal Wolsey and then by King Henry VIII. The magnificent surroundings were where Lewis Carrol wrote Alice in Wonderland. For our final night we enjoy the Captain's Farewell Dinner aboard. Following breakfast, disembark at 10 am and transfer to the designated drop off point. NOTE: On alternate weeks, cruise will be in reverse direction. This is a sample itinerary and is subject to change. Various pick up and drop off points are avaiable for charter groups.